The following article is from Chicago the World’s Youngest City published in 1929, written by Frederick Stock, CSO Conductor from 1905 until 1942. In reviewing the history of the Chicago Symphony Orchestra one must go back farther than the first concerts actually given by Theodore Thomas in the Auditorium. Attempts to inaugurate concerts were made long before that time and it would be necessary to go back to the year 1850 to trace the first steps in the direction of orchestral music. The beginning is significant, even though attended by quick failure, for the first efforts had been made to bring a new culture into this fast-growing metropolis. The most vital early attempt in this direction was made by Hans Balatka, under whose direction the Philharmonic Society had its beginning. With the enthusiastic support of a few far-sighted citizens, who felt convinced that culture need no longer be confined to the East, this organization continued for a number of years, giving concerts and blazing the trail for Theodore Thomas, who was to follow in a few years. However, the time was not yet at hand where the spirit of the enterprising West was prepared to throw itself whole-heartedly into the support of musical organizations; and so the Philharmonic Society, meeting with growing obstacles, had to disband. An event of early importance was the visit to Chicago, in 1869, of the Theodore Thomas grand concert organization. Thomas had become convinced that his orchestra was well enough known throughout the country to insure the success of a tour. After putting it on a secure basis he had taken the whole organization on a tour as far west as Chicago. During that visit Thomas made many friends here and a return tour was arranged. The following year seven concerts were given, the programs consisting of many works that were new to Chicago. 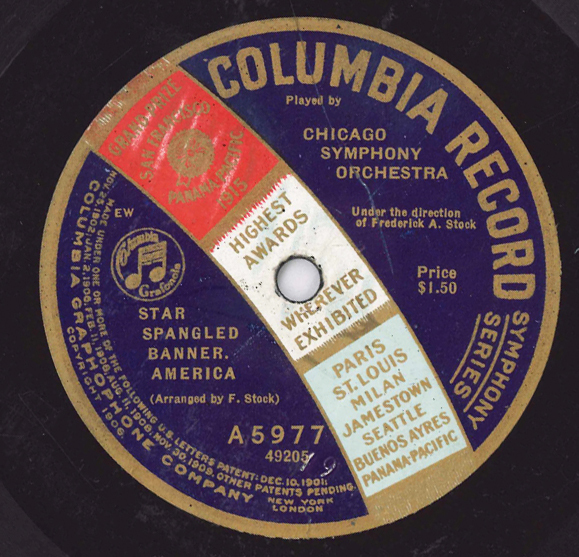 The year 1877 saw another big step in the musical life of Chicago. 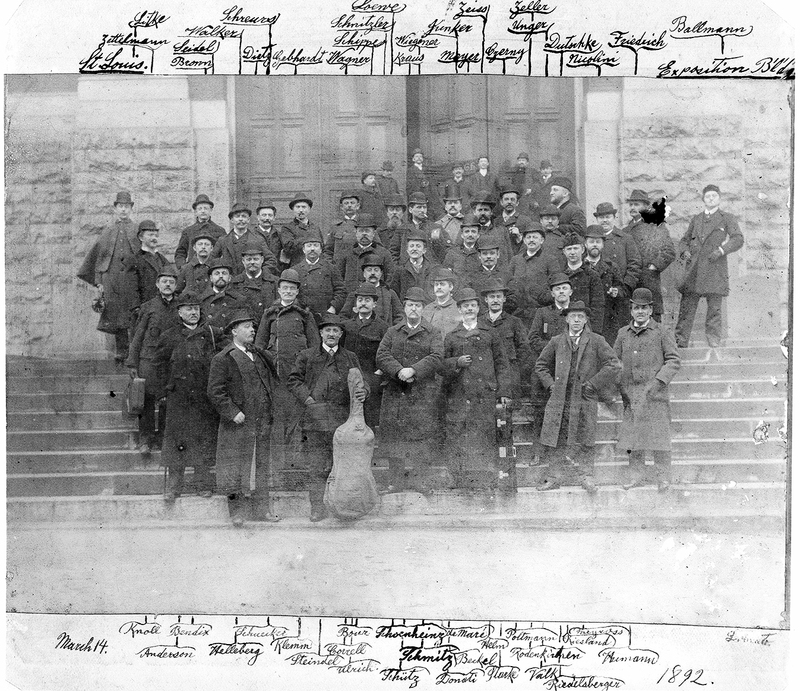 This was the organization of summer night concerts in the Exposition Building, the success of this venture culminating in 1890 in the birth of the orchestral association. During the thirteen years of these concerts in Chicago, Thomas received constant assurance of the loyalty and appreciation of his audiences; and it was due to this fact that, when the prospects for his orchestra seemed hopeless in the East, he decided on Chicago as the center where he might best carry on his pioneering in the field of music. Thomas had become assured that the constant traveling necessary to the financial success of his organization, and the consequent overwork to himself and the members of his orchestra, would prove ruinous. After the failure of New York to provide him with a hall in which to continue his concerts and with not an endowment which would have been necessary for their maintenance, Thomas accepted the invitation of some enterprising and courageous citizens of Chicago to bring his players west. He brought sixty members of his New York orchestra, which he augmented when he arrived in Chicago. The association which at that time assumed the financial responsibilities of the orchestra in Chicago has ever since then operated on a continuous basis. In the autumn of 1891 the Chicago Orchestra gave its first concert in the Auditorium, Theodore Thomas conducting. The first season consisted of twenty Friday afternoon public rehearsals and twenty Saturday evening concerts, with later on several weeks of opera and concerts on tour. The early days of the Orchestra were filled with difficulties. Culturally and musically Chicago had not made very great strides. It was still largely a city of factory workers, earnest and hard-working people to whose zeal Chicago owes so much today—but too vitally interested in the city’s material growth to give much thought to its artistic development. This fact made it very difficult not only for Thomas to find members for his orchestra and keep contented those he already had; but it made the moulding of an audience also a great task. Furthermore, the need of a permanent home for the Orchestra became constantly more evident. The Auditorium proved entirely too large. Due to its great size, the audiences never felt the necessity of becoming subscription holders, a factor obviously important in the early life of an organization. The size of the audience was therefore dependent upon the vicissitudes of weather or upon any distracting amusements that came to town. The building of Orchestra Hall and the raising of the necessary funds will always stand as a triumph in the musical history and growth of Chicago. No greater tribute could have been paid the man who was responsible for the creating of musical life in Chicago, no firmer assurance given the future of his enterprise, than the response of the public to his plea for a home for the Orchestra. Rich and poor alike contributed, there being 7,500 subscribers to the fund of $800,000, the gifts ranging from ten cents to $25,000. 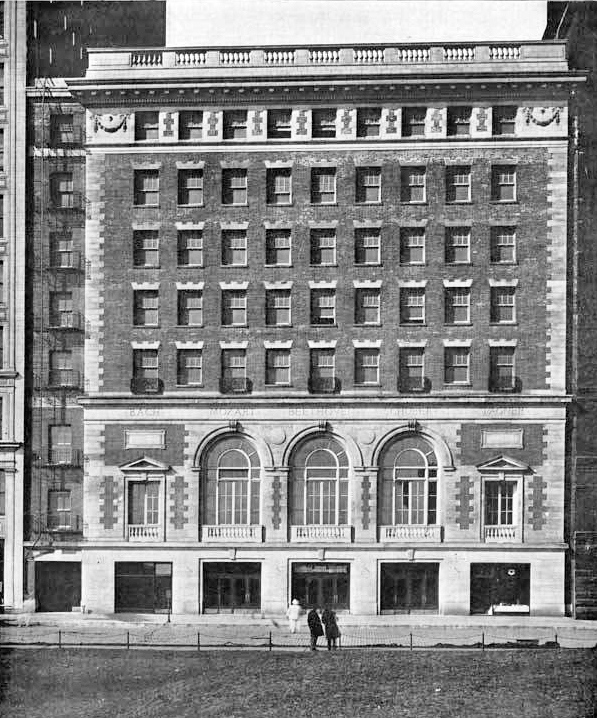 The goal of which Thomas long had dreamed had finally been reached; and he felt that with the dedication of Orchestra Hall in 1904, the future of his Orchestra was secure. Destined to see his life work completed, the hopes of the earliest days of his career fulfilled, Thomas died a few weeks later. The name of Theodore Thomas always will be linked with the history of music in our country as that of its greatest pioneer. Without him and without his firm belief in the American people as a cultural and music-loving nation, the cause of great music in America would have been retarded for many years. The history of the Orchestra since the days of its founder is perhaps largely one of statistics, but there are many factors in its growth and development which are of interest. The importance of an organization such as this, and its effect on the musical life of the community, can hardly be over-estimated. Its influence reaches not alone the vast numbers of persons of all classes for whom it gives concerts, the programs for which are especially arranged to suit their taste and appreciation; but it affects the life of the musical schools and colleges. It goes into the private and public schools, as is seen by the cooperation they have given the Orchestra in its efforts to develop the children’s concerts. There is no phase in the musical life of Chicago which is not affected by the importance of its Symphony Orchestra. Perhaps the most interesting phase, in the development of general taste in music, has been the raising of the standard of the programs. At the beginning of the century the programs were of a very different calibre, than those of the present, consisting at first of very light and so-called “popular” music. Often they contained only detached movements of symphonies and excerpts of larger works. But the standard of the public’s demand for good programs has steadily risen, until now, for the three series of concerts, given annually by the Orchestra only works of the most important calibre are played. An increasing demand for concerts in its home has been met with an ever-growing number of concerts. With traveling and out-of-town appearances reduced to a minimum, except in the immediate vicinity of its home, the Chicago Symphony Orchestra now averages one hundred and thirty concerts in its regular season of twenty-eight weeks. This development has witnessed the inauguration of a series of children’s concerts. The popularity of these is indicative of the importance of the Orchestra as a cultural asset to the community. The programs consist of forty-five minutes of music, of light but pretentious character, and fifteen minutes of explanatory talks as well as slide pictures. The children are asked to participate, in the singing of songs and the response to questions; and their cooperation is wholehearted. The latest step in this direction has been an agreement by the Orchestral Association with the Superintendent of Schools to further the study of music in the public schools of Chicago. This provides for a four year course of study to include history of music, rhythm and form. During the course of these studies, illustrative programs, keeping pace with the progress of the students, are to be played by the Orchestra. These are to be known as Young People’s Concerts. Another interesting feature in connection with the Chicago Symphony Orchestra is the Civic Orchestra. 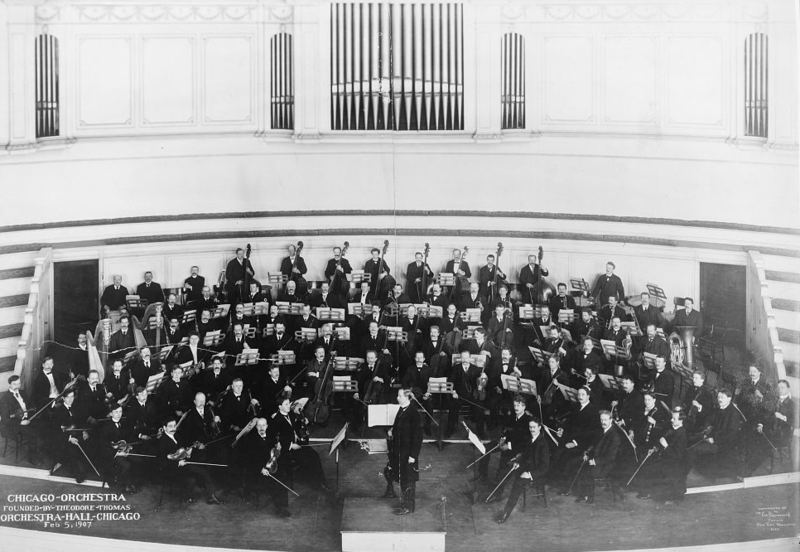 Organized in 1919, this Orchestra is governed by the Orchestral Association and the Civic Music Association. Its purpose is the training of symphony orchestra players. Besides the opportunity it offers young people with talent to receive the valuable training of orchestral playing and ensemble, the Civic Orchestra also gives composers a chance to hear their works at rehearsal, an experience of great value to many of our gifted creative artists. The Civic Orchestra has supplied leading orchestras throughout the country with players, thirty-five of its members having been taken into large orchestras. The Chicago Symphony Orchestra rests on a solid and substantial foundation. The fact that its history is one of constant development is largely due to the loyalty, appreciation and encouragement of Chicago’s music-loving public. This is the mainstay of its support, as well as the safest assurance of its permanency. 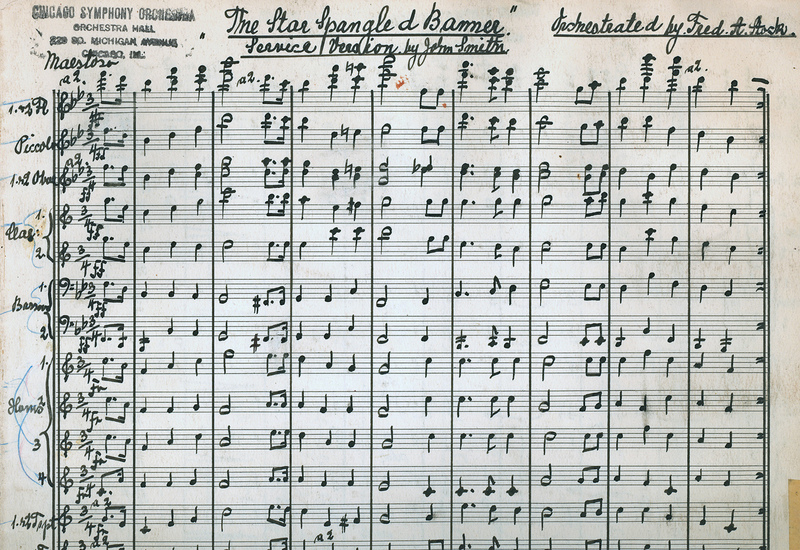 The title page of Frederick Stock’s post-1917 arrangement of The Star-Spangled Banner, the version currently used by the Chicago Symphony Orchestra.